Malapascua Legend Water Sports & Resort is located two and a half hours away by car, and about four hours away by bus from the city of Cebu. From the Maya Port, guests can ride a “bangka” going to the island, but the hotel offers private boat transfe... Malapascua Legend Water Sports & Resort is located two and a half hours away by car, and about four hours away by bus from the city of Cebu. From the Maya Port, guests can ride a “bangka” going to the island, but the hotel offers private boat transfers, for a surcharge, upon request. Malapascua Legend aims to provide its guests with modern, and highly comfortable amenities that will surely make for a hassle-free and memorable stay on the island. The hotel has a swimming pool that caters to both kids and adults who are looking for a way to have fun, and to beat the heat. The hotel's Pirates' Resto Bar services delectable local dishes that will surely delight your palate. WiFi is free, and is accessible at pubic areas within the hotel's premises. Each fully air conditioned room at Malapascua Legend comes with a cable TV, a minibar, and a provision for LAN internet. The attached toilet and bathroom has a shower, with hot or cold water, and towels and basic toiletries are also already provided for in each room. Picture a total paradise where the sky meets the sea, where heavenly accommodations tuck you in when the sun sets—that is Kandaya Resort. This five-star property nestled along the shores of Daanbantayan in Cebu will take you away from the hustle and ... Picture a total paradise where the sky meets the sea, where heavenly accommodations tuck you in when the sun sets—that is Kandaya Resort. This five-star property nestled along the shores of Daanbantayan in Cebu will take you away from the hustle and bustle of the city and into a calm and tranquil atmosphere conducive to rest and relaxation. For pleasure seekers out there, Kandaya Resort is a true definition of tropical haven. Set in Barangay Agujo, the resort faces the Visayan Sea, giving guests access to amazing sunset views. In addition, its long stretch of white sand and blue sea offers you limitless options when it comes to recreation. Named after Datu Daya, an ancient tribal chieftain of Daanbantayan, Kandaya Resort is a place where the old meets the new. It is a place where you can experience simple paradise living while enjoying access to modern comforts and conveniences. You'll discover simple nature pleasures existing alongside state-of-the-art facilities and amenities for both old souls and modern-day travelers. If you want to reach this haven, it's a three-hour drive from Mactan-Cebu International Airport via private vehicle. Kandaya Resort also offers land and air transfers for a more convenient arrival. If you opt to commute, there are public buses to Daanbantayan from North Bus Terminal in Cebu City. Find peace and privacy in the well-appointed and lushly designed rooms at Kandaya Resort. Whether you seek to indulge in the trappings of paradise by yourself or with your loved ones, you will find accommodations that will suit your fine tastes and your needs. The resort has an array of rooms set in minimalistic contemporary designs and fitted with all the essential amenities most travelers look for in an accommodation. Choose among humble guestrooms, luxurious suites, and even spacious villas for your home away from home in Daanbantayan. No matter what accommodation you choose for your stay, Kandaya Resort ensures your comfort and well-being by providing convenient amenities in every single one of its well-designed rooms. Expect each abode to have flat screen TVs with cable shows, a mini bar, a safety deposit box, and a writing desk on top of the essentials: beds fitted with premium linen, air conditioning systems, and en suite bathrooms with an indoor shower. Kandaya Resort's private white sand beach promises a day of sun, sand, and sea for all guests. You can take a cooling plunge in the turquoise waters of the sea or work on your tan while relaxing on a sun lounger on the white sandy shore. Moreover, the resort offers various aquatic sports and activities guests can take advantage of. Have an adrenaline rush as you try out kayaking, sailing, snorkeling, and other non-motorized water sports. For those who want to explore more of Daanbantayan, Kandaya Resort also offers cruises. Sit back, relax, and enjoy the breeze as you sail across the mesmerizing waters of the Visayan Sea. But if you want to see underwater wonders, then you best take advantage of the scuba diving activities available onsite. Beyond the stunning private beach, Kandaya Resort has more to offer pleasure seekers. Its outdoor swimming pool is perfect for a relaxing dip and treats you to a marvelous view overlooking the Visayan Sea. Dining is also another pleasurable activity you can enjoy in Kandaya Resort. Flexible dining arrangements are offered onsite so whether you prefer a romantic meal on the beach or in the comfort of your own room, you will enjoy delectable dishes for your stay. For your holistic well-being, Kandaya Resort is also equipped with a spa. Treat yourself to a pampering session and avail of any of the various massages and spa treatments available. Whether you prefer Shiatsu or traditional hilot, you are sure to be relaxed and well-rested after your spa day. Meanwhile, active guests may use the state-of-the-art equipment at Kandaya Resort's gym or learn new combat skills at the onsite Mixed Martial Arts (MMA) training center. There are also sports facilities onsite, including a basketball and tennis court. 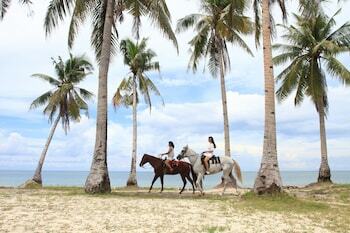 Another must-try activity at Kandaya Resort is horseback riding. The onsite Kuwadra has varieties of horses and ponies that can take you around the resort. It is a unique way of exploring the grounds and is fit for all ages. While it is undeniable that Kandaya Resort is a paradise on its own, Daanbantayan, the municipality where it is found, also has plenty of other attractions you simply should not miss. Daanbantayan is a coastal town located on the northernmost tip of the island of Cebu. Home to plenty of natural wonders, it is the ideal destination for nature lovers and adventure seekers. Daanbantayan is known mostly for Malapascua Island, an island that is small in size but home to plenty of beautiful white sand beaches. Located 30 minutes away from Kandaya Resort, it has many beach resorts dotting its shores for those who want to stay the night. Aside from beach bumming, the island is also a known dive site. It has a bustling marine ecosystem that is home to an abundant coral reef and various species of marine animals, including thresher sharks. There are also wreck sites. Malapascua's underwater world is truly captivating, which is why divers, whether novice or expert, come here to see the beauty of the island themselves. There are plenty of dive shops around the island but for your hassle-free diving experience, Kandaya Resort has an onsite dive shop that can take you to Malapascua Island's popular dive spots. Meanwhile, a 50-minte boat ride from Malapascua Island, is Gato Island, another interesting spot in Daanbantayan. It is a small, rocky island located in the middle of the Visayan Sea that is home to various species of birds, fishes, and other animals. With a number of underwater caves filled with plenty of marine animals, it is also a popular spot among scuba diving enthusiasts. Earn as much as 931 points.